Among the many dermatologic and cosmetic surgeries that are performed today worldwide is a procedure called blepharoplasty. Blepharoplasty can be loosely defined as eyelid lift surgery (which can be performed both upper and lower lids). According to recent data recorded by the American Society for Aesthetic Plastic Surgery from 2013, blepharoplasty rates high on the list of most popular surgeries. Specifically, of the top 5 cosmetic surgeries performed in 2013, blepharoplasty is 3rd on the list, following liposuction and breast augmentation. Dr Lanzer has been performing this procedure since 1994 when the concept of lasers came into being. He spent time in the USA under an eye surgeon and then was one of the first to use and teach the C02 laser method. The eyes are a very central part of the face. When looking at someone and especially when talking to another person, our focus goes almost directly to the eyes even without realizing it. As such, the eyes play an essential role in basic communication, relationships, and of course in an attractive appearance. Having said that, a person will always want to make sure that their eyes are as charming and pleasing as possible and give of a refreshed and rejuvenated appearance. Of course, applying appropriate eye make-up will enhance the eyes a great deal. But what about when the eyes start to give a tired, droopy, and baggy appearance? This can happen to anyone, particularly if there is a genetic tendency, but this usually happens as you age. 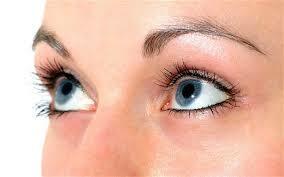 For various reasons the upper eyelids begin to droop, the eyebrows start to sag, and bags start forming under the eyes. This can make one look older and more tired than they really are. The reason for the sagging and drooping is due to excess fat, and/or skin that develop in the area of the eye, either on the upper lid or lower lid. Along with the aging process, the skin of the eyelids loses its elasticity (as it does in the rest of the body) and causes the skin to sag. Additionally, the muscles which have supported the eyelids begin to weaken. These two reasons allow excess fat to gather in either the upper or lower eyelids (or both) which creates a sagging and puffy look, and lends to a less attractive appearance. Additionally, when there is too muck skin or fat hanging over the upper eyelid, eye makeup cannot be applied properly and cannot really be seen. Although aging is the primary cause for heavy eyelids, sun exposure and genetics also play a role in this development. Treatment for this somewhat unattractive appearance is blepharoplasty which can greatly enhance one’s looks and have them looking as rejuvenated as they should be. Discover Eyelid Surgery Treatment Advantages! An increasingly large amount of patients now opt for Eyelid Surgery Treatment procedures. Some before and after photos shown are not exact, in that they vary in light, contrast, clothing, background, distance from camera, hairstyle and make-up. If you’re looking to remove fat from the eye, get a free consultation at Melbourne Eyelid Surgery Treatment clinic with Dr Lanzer. All that was previously stated primarily relates to a less than attractive cosmetic appearance of the eyes due to the heavy eyelids. Another important related point to discuss is medical necessity for blepharoplasty. In some cases the heaviness and drooping of the upper eyelids can be so severe that it droops downwards and impairs and obstructs vision (often peripheral vision). In some situations, the eyelashes drape over the eyes which also limits the vision since the skin that has been holding it in place has weakened and become stretched out. Additionally, extreme sagging or puffy eyelids on either the upper or lower lid can create a situation where it is difficult to put in contact lenses or even wear glasses. Another detrimental effect can be ensue is when a person who has drooping eyelids tends to overuse the muscles in the forehead and in the eyebrows in order to try and raise the drooping eyelid. This often results in increased forehead tension and possibly headaches as a result of the impaired vision. Another negative side effect of puffy eyelids is that sometimes there can also be increased discomfort of the folds of the eyelids due to the excess skin and fat which now rub together more so than before. Reasons like these would lead to the true need for a blepharoplasty which is required due to medical necessity and not for cosmetic reasons like many believe. A brief explanation of what is done during blepharoplasty offers a clearer picture of how someone’s medical condition can be improved as a result. Blepharoplasty can be performed either by an eye surgeon or by a dermatologist or a cosmetic surgeon. As with all surgeries, it is important to choose a surgeon who is certified, experienced, and one who you feel comfortable with. Blepharoplasty can be done either under local anesthesia or general anesthesia . This should be discussed with the surgeon prior to the procedure to work out what is best for you. The surgeon will make a small incision (or incisions) in the area which needs improvement. These incisions are done in location which will hide any potential scarring thereafter (i.e. in the crease of eyelid, right beneath the lower lashes, or within the natural folds of the lid). According to what is necessary for each particular patient, the surgeon will excise any excess skin. Any excess fat will either be removed or shifted to a better position. Sometimes muscle is also removed or is sometimes tightened with sutures as is necessary. The skin is then closed back up with small neat stitches for a clean look. The results from your blepharoplasty can be amazing. Now you can see well without having your eyelids sagging and blocking your vision. You can now relax your forehead muscles and get relief from those tension headaches. Plus, you get all the cosmetic benefits as well and look refreshed and rejuvenated. All surgery has risks and the yes commonly swell and develop initial bruising. In all the years that Dr Lanzer has been performing this procedure he has not seen any more long term effect on the vision. He also has only needed to repeat it once or twice. Some patients can have initial numbness of the lids, or difficulty fully opening the lid as it is lazy with the bruising. Make up can be applied 7 -10 days after surgery.